Once again we find Casey Affleck cast as a confirmed misfit. 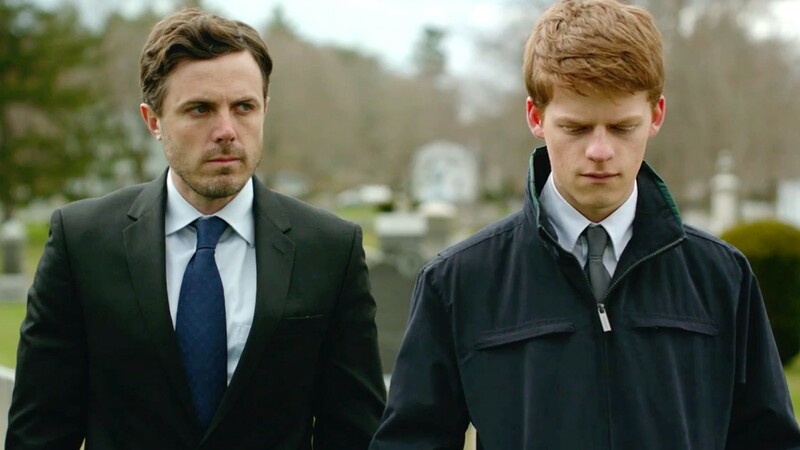 This time, in Kenneth Lonergan’s iffy kitchen-sink family drama Manchester by the Sea, Affleck plays Lee Chandler, a haphazardly employed janitor haunted by his tragic past, who manages to confront his demons by interacting with his teenage nephew Patrick (Lucas Hedges, in an impressive performance), son of Lee’s late lamented brother (actor Kyle Chandler, seen in flashback). Former fishing boat hand Lee is the type of guy who frequents bars and invariably picks a fight. He blames himself for his brother’s death, while Lee’s ex-wife Randi (an under-utilized Michelle Williams) blames Lee for everything else, including the fire that incinerated their three children, due to Lee’s drunken negligence. Everyone in writer-director Lonergan’s scenario is bitter and edgy. It’s a familiar rough, tough, hard-luck, working-class Massachusetts set-up, instantly recognizable to anyone who’s seen Mystic River, Black Mass, The Departed, The Fighter, or generally any film starring Matt Damon or Casey’s brother Ben. To say these archetypal characters and settings have been overexposed would be an understatement. And yet Lonergan (who helped write Gangs of New York) scores points by demonstrating the hypocrisy of small-towners who feel obligated to greet their neighbors, but who actually hold each other in contempt. The main attraction here is young actor Hedges (Moonrise) as the hockey-playing lover-boy Patrick, a hothead like all his relatives, but one who nevertheless catches a glimpse of his possibilities. Williams should have been given more to do; she might have rescued the movie. As for Affleck, it would be refreshing to see him portray a wisecracking, devil-may-care life of the party for once. But it evidently just isn’t in him. Approach Manchester by the Sea with caution.